We wanted something simple for a crib and this Babyletto Madison crib kept coming up over and over again as a favorite when we were looking. 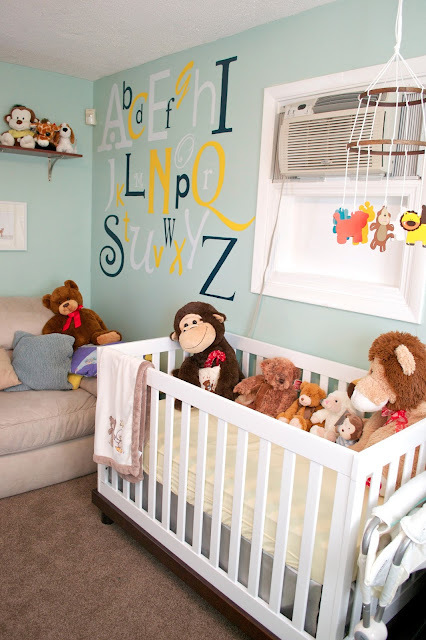 We really liked the fact that it was a white crib so it wouldn't overwhelm the room but had the dark brown base which felt a little more boyish. This combo on the crib is what has inspired the brown/white combo in the rest of the room. The other thing that we really liked about this crib is it's versatility. The fact that all the sides are the same level give it a modern look but also allows us to place the long or short side against the wall or have it sit in the middle of the room and still access the baby on any of the sides. It is also a convertible crib so the mattress drops as the baby gets bigger and then it turns into a toddler bed so it will be getting a lot of use for many years to come.